Red Box Engineering offer a first class sheet metal fabrication and steel fabrication service in Totton, Southampton and throughout the UK. This includes everything from design and punching to folding and welding, as explained in more detail below. We use the latest in CAD/CAM technology from Radan in order to nest both simple and odd shaped components onto as single sheet to obtain maximum output from the material reducing costs for our customers. A supplied DXF CAD drawing allows us to quickly create the codes necessary to facilitate the production of parts for either the waterjet or the CNC Punch, therefore offering an improved design. We utilise the CNC Punch to provide fast, economical production of 2D cases, shims and brackets. This ensures that everything is ready for the Press Brake to be formed and bent into the required 3D production. 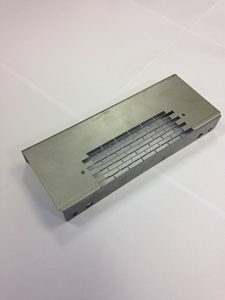 Furthermore, our CNC punch allows us to produce profiled flat pattern sheets, which can form create cases, enclosures and more. 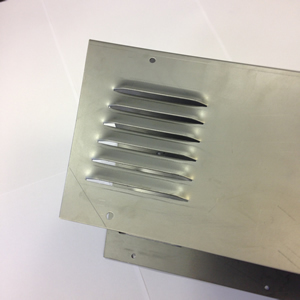 We have intricate tooling features such as a louvre punch to provide venting outlets in the sheet metal. As a result, this is used in a variety of forms of sheet metal fabrication, such as computer cases through to large power units. 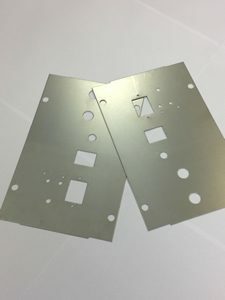 If you are looking for panels, lids or items that need to be folded in various forms to meet your project specifications our Press Brake is used to achieve these results. Tooling allows the forms to be completed accurately and to the desired angles to create the finished product. Our employees have a wealth of experience creating a vast array of different forms. Due to this our team to advise and develop with the customer any bespoke items that maybe needed. 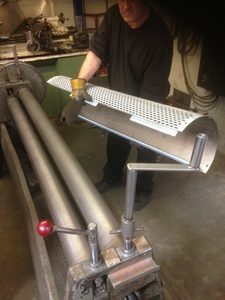 Our welders are integral for the completion of the sheet metal fabrication process. The formed and machined parts that we create will be assembled ready for the welding process. Our welders are experienced in working with aluminium, stainless steel and mild steel using Mig/Tig methods and arc welding. 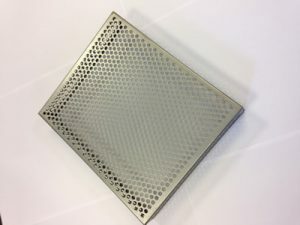 Furthermore, for specialised projects in stainless steel and aluminium, Red Box Engineering invested in an electro polishing machine which removes the weld burn left behind from the welding process. As a result, this produces a shining finish which our customers say helps to promote the quality of their products to customers. Red Box Engineering are based in the Southampton, providing sheet metal fabrication and steel fabrication throughout the UK. Further to this, enquiries can also be sent by filling in our online contact form.